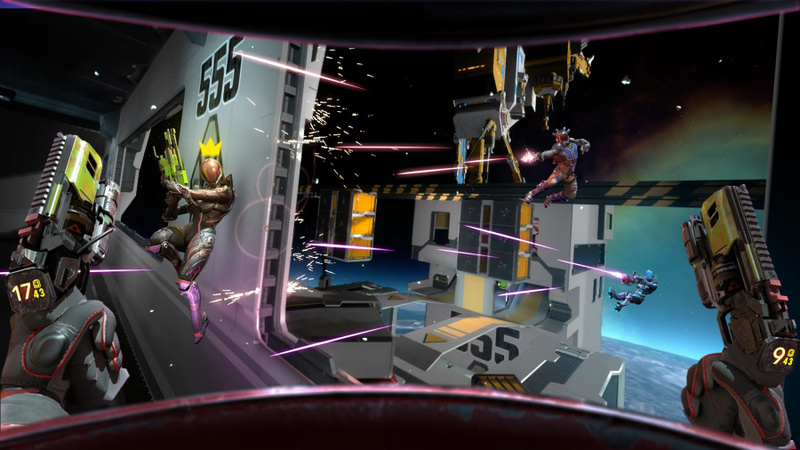 The thought of controlling a zero gravity first-person shooter in VR sounds like a headache, but Space Junkies’ controls are surprisingly serviceable and easy to grasp given its concept. PS Move support is non-existent, but a DualShock 4 gets the job done. Horizontal and vertical movement are separated across both sticks, each set of triggers controls a different hand, and aiming your weapon(s) is done by moving your controller. While said aiming can feel frustratingly imprecise at times, moving around the game’s environments and using terrain as cover doesn’t take long to get used to. A quick tutorial helps you get acquainted with things before dumping you into a match, and there are plenty of optional features to alleviate motion-sickness. It’s an all-around accessible experience. 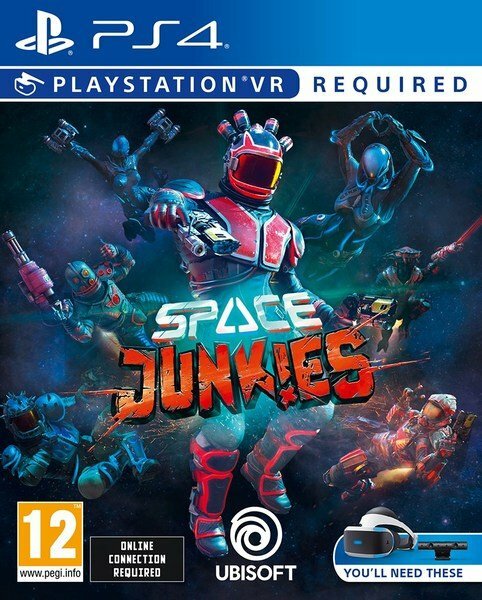 Space Junkies’ greatest strength comes in the presentation department. 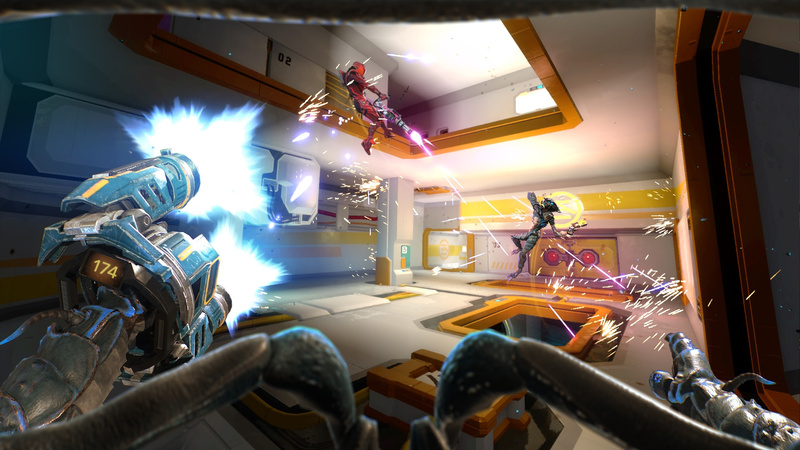 Being developed by an internal Ubisoft studio, there are plenty of bells and whistles on display that aren’t typical for other multiplayer VR shooters. The game looks great thanks to excellent art direction that fills its cosmic locales with a vivid neon colour palette, and there’s a great community space to play around in before and after each match. This common space lets you interact with other players while you’re waiting for the matchmaking to do its thing, and it has a ready room that lets you seamlessly vote for the next map and mode without skipping a beat. It all feels slick and works well even though it suffers from form over function. 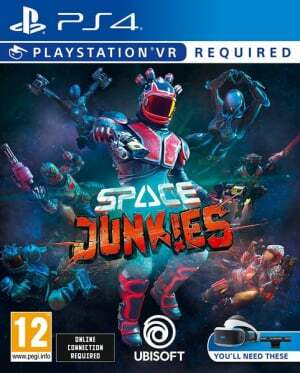 Space Junkies does a lot right, but its biggest blunder is its cross-play implementation. 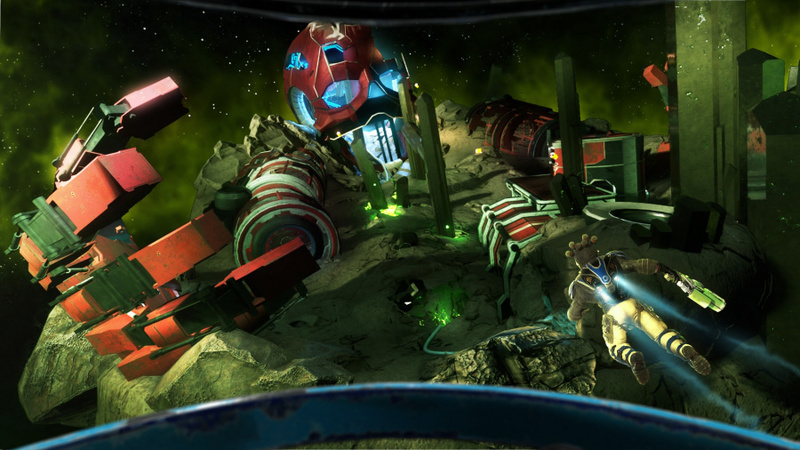 If you’re playing on PSVR, prepare to feel like a second-class citizen. There is heavy emphasis placed on dual-wielding weapons and making wacky hand gestures, but neither work well with a DualShock controller, which is your only option. Your hands are perpetually stuck in a stiff-looking outstretched position that makes it obvious to everyone that you’re playing on PlayStation while they get to have all the fun waving and fist-bumping. It’s a silly thing to complain about, but it’s hard not to feel like you’re being left in the dust simply because you’re playing on a different platform. You’re also unable to aim any dual-wielded weapons in different directions which not only makes aiming more difficult for you than your PC competitors, but it also limits your ability to shoot around obstacles. Finding a match doesn’t take long, but it comes at the hefty cost of one of the game’s main selling points when you’re not playing on a PC. 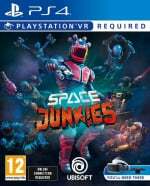 Space Junkies is an incredibly competent multiplayer arena shooter that dodges the VR matchmaking bullet by flexing its cross-play capabilities, but it suffers from inadequate implementation. There’s plenty of bullet-blasting action to keep you engaged, but the limited control options only let you partake in a fraction of the fun when compared to your PC brethren. I couldn't get with the controls tbh in the beta. Plus I'm concerned that PC players have too much of an advantage with their motion controllers. Still nice to see Ubisoft supporting the platform still. This game is a blast on PSVR. Regardless of control scheme. Once you're used to it.. it's fine. I hold my own with PC players. And there is indeed Move controller support coming.